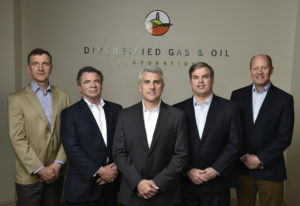 Home Central Highlands Petroleum Company Discovers Liquidity in U.K.
DGO leadership team members include (from left) Martin Thomas, director; Robert Post, chairman of the board; Rusty Hutson Jr., CEO, founder and director; Bradley Gray, finance director and COO, and David Johnson, director. The oil and gas may lie beneath the Appalachians and the company’s public trading may be based in London, but the company headquarters are much closer to home — right here in Birmingham. The company is Diversified Gas & Oil. It has made its mark by buying conventional oil and gas wells from larger producers who have shifted their focus to unconventional wells. The sellers are now working in shale formations, which usually means horizontal drilling and oftentimes fracking. The conventional wells they’re selling typically involve vertical drilling, are less complicated than horizontal drills and have a demonstrated long production life. As shale drilling has led America’s resurgence in oil and gas production, the conventional wells have often gone neglected, perhaps underperforming because of poor management. That’s when DGO stepped in, buying up the wells that lie mostly in Pennsylvania, Ohio and West Virginia, retaining the employees that worked the conventional wells and leveraging their experience to improve the wells’ efficiency. DGO has expanded rapidly since it went public in 2017 — thanks to almost $900 million in acquisitions. But DGO is still a small company compared with the behemoths in the oil and natural gas industry. That probably won’t change anytime soon, even though DGO is poised to become — or might already be — the largest company of its kind in the Appalachian Basin. 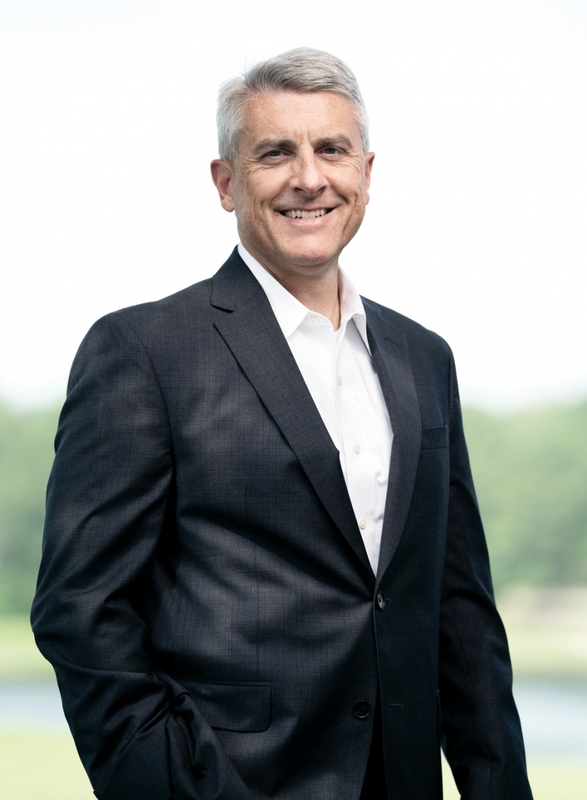 Company president and CEO Rusty Hutson Jr. likes where the company is. Hutson knows oil and gas as well as numbers. He was born and raised in West Virginia, and his ancestors worked in the oil fields there as far back as the early 1900s. His father, grandfather and great grandfather all worked in the oil fields, and Hutson did too during the summers of his youth. But after graduating from Fairmont State College with a degree in accounting, he took a different career path. He was a numbers cruncher, working for an Ohio bank, becoming a CPA there and eventually moving to Birmingham to work for Compass Bank, where he became the CFO for Compass Financial Services. Sometime around 2000, Hutson’s father told him about some wells for sale in West Virginia. He told Hutson that the wells were good and that the woman who owned them was open to financing the deal. She ended up lending $180, 000, and Hutson took out a home equity loan for $80, 000 to complete a $260, 000 purchase. Hutson suddenly had oil wells on his hands to manage, and that was the beginning of DGO in 2001. For the next few years, he continued to work at Compass during the day and managed his wells at night. Around 2005, he turned down an offer to move to Houston with Compass and left the bank to concentrate fully on his oil business. Building the company took time, but more than 10 years later, Diversified Gas & Oil went through changes that Hutson calls “transformative, ” including going public. That was not easy. The company was small, and its business model of buying conventional wells was perceived as out of style. According to Eric Williams, DGO’s chief financial officer, “The U.S. equity markets … saw a small, conventionally focused operator as a bit of a nonstarter. The decline in commodity prices beginning in 2014 put a significant strain on companies in the oil and gas industry. A company focused on anything but shale was of little or no interest for the U.S. equity market. Continuing to search for options, Hutson was introduced to an equity law attorney in London, and that eventually led to the company’s listing on AIM, which is part of the London Stock Exchange. Begun in 1995, AIM is geared to small companies and is the most successful growth market in the world. Since its launch, more than 3, 600 companies from across the globe have joined AIM, according to its website. Early this year, DGO put itself on the map with two acquisitions totaling $180 million. It bought Alliance Petroleum and the conventional, Appalachian Basin assets of CNX Resources. That increased the company’s asset acreage from 1.6 million acres to 4 million and its production almost tripled from the equivalent of 10, 400 barrels of oil per day to 28, 000. Although DGO produces mostly natural gas, the industry usually expresses volume in oil equivalents. That was followed in June with DGO’s largest acquisition to date, in which the company agreed to pay $575 million for a network of additional assets in the Appalachian Basin. As this issue of Business Alabama goes to press, DGO is waiting to close that deal, which would increase its daily production by 114 percent, to the equivalent of 60, 000 barrels of oil a day. The deal would increase its proved developed producing (PDP) reserves 142 percent to the equivalent of 393 million barrels of oil (mmboe), with a present value of $1.4 billion, up from 163 mmboe with a present value of $584 million. Earnings are forecast to jump 225 percent from before the acquisition to $237 million. The latest acquisition includes about 11, 250 wells added to roughly 43, 000 that DGO already operates in the Appalachian Basin and includes wells in Kentucky and Virginia. The latest acquisition also includes 6, 400 miles of pipelines that provide access to a processing plant and 59 compressor stations. DGO is the largest company of its kind on AIM, and its latest acquisition is the largest ever among AIM-listed oil and natural gas companies. It will likely make DGO the largest company of its kind in the Appalachian Basin, according to Williams. Following the latest acquisition, DGO will have about 700 employees. The executive team, heavy on financial and oil industry expertise, is in Birmingham and has strong local and Appalachian Basin connections. In addition to Hutson, the Birmingham team includes Finance Director and U.S. COO Bradley Gray, a University of Alabama accounting graduate and CPA, and Williams, a CPA with an accounting degree from Samford University and a master’s from Alabama. Also in Birmingham are Bryan Berry, who holds a master’s in accounting from Alabama and is vice president of finance, and Michael Garrett, vice president of accounting and controller. Hutson and Gray are board members. Robert Post, non-executive chairman of the board, also lives in Birmingham. He graduated from Jacksonville State in accounting and joined the company in 2005 as 50 percent owner with Hutson. Working in one of those field offices is Hutson’s father, Rusty Sr., who lives in West Virginia and is the company’s vice president of operations in West Virginia and Ohio. Charlie Ingram and Cary Norton are freelance contributors to Business Alabama. Both are based in Birmingham.